Nothing that we could do could stop KCGL from changing their format. It wouldn’t have been that big of a difference except that there were no other alternative or new wave stations on the radio at that time. Suddenly, we went from 24 hours a day down to one or two hours a week on public radio. After a couple of months, I was desperate for new music. What I didn’t tell you was about this poster. 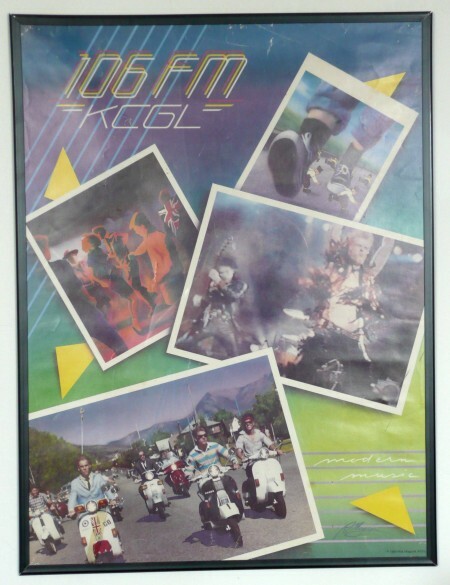 I loved KCGL and I loved this poster even more. I looked at those guys on the scooters and tried to recognize them. I used to imagine that it was Soren Winslow on the left in the blue suit. The drawing on the upper left reminded me of the Ritz and I used to look at it, wishing for the weekend to come sooner. I didn’t get this poster until after KCGL died, so it felt very special and precious to me. I’ve kept it safe for a quarter of a century and now it hangs in my office with love. And now today I can build my own radio station in Pandora and care less about what happens to a broadcasting radio station. It’s a rare event that I turn on the AM or FM radio in my car today. I just plug in my iPhone and start the Pandora app. Coming Real Soon Now will be Pandora built into cars and I suspect broadcast radio will have to make dramatic change in order to stay relevant. Satellite radio had little impact on broadcast radio, despite (now rather ironic) predictions but ubiquitous Internet may well be the death knell for Clear Channel! Response in re Baby Pain Love that song- the band was Interferon. Enjoy.